Serge, April and me were discussing a problem with pulling out InfoPath Attachment from InfoPath form XML and writing them into a SharePoint document library. This is a problem I tried to tackle before, but came to realization that I would need an AzureFunction. The main reason is that the InfoPath attachment is a base 64 byte array but the byte array has a variable length header that includes the attachment file name. Flow doesn’t have amazing byte manipulation or left-shift abilities. So we need to write an AzureFunction to help. This blog is my version of the answer. //Position the reader to get the file size. body: "Please pass a base64 file in the request body"
Debugging and tweaking the byte offset is quite a bit of trial and error, was not expecting that. May be that MSDN article is too old, it is from 2003. You may think - John 2018 is not the right year, or decade to be writing about InfoPath. But hear me out. 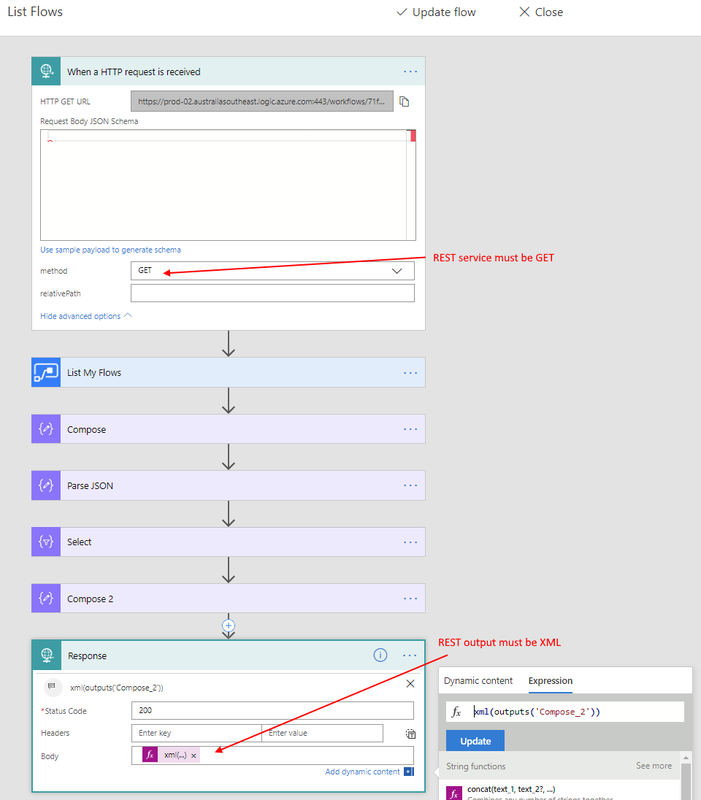 As companies move their form technology forward, they will need to consider how to migrate the data and attachments in their current InfoPath forms somewhere - having this blog post as a reference is important for that eventual migration. Good luck! This is a write up of various ideas and thoughts that I've shared over Twitter separately, but needed to be linked together and the example steps needs to be explained in a bit more detail. 4. 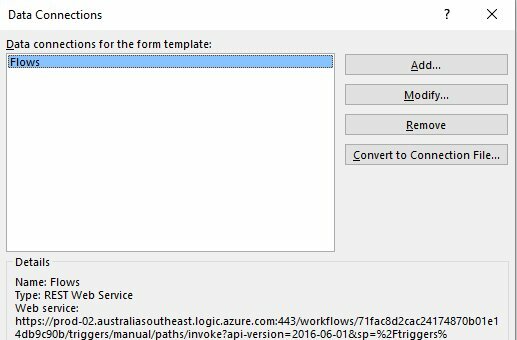 InfoPath will happily call this Flow, and we now have server side superpowers in InfoPath. If you are thinking about how to upgrade libraries full of InfoPath XML files into just list columns or database. with game state managed with Microsoft Flow, with JSON and XML dual binding. This is how a InfoPath cross PowerApps game of O and X can be build, with Flow managing the game state. That ones a game changer for me. Looking forward to seeing how you use it. In this Flow, we will do something fancy. We will use the new Flow Management connector to list all the Flows in my environment. The response must be XML - use xml() to convert JSON into XML output. This is how you test a webservice. You poke it with Postman. Connect it via REST connection. This is pretty amazing. 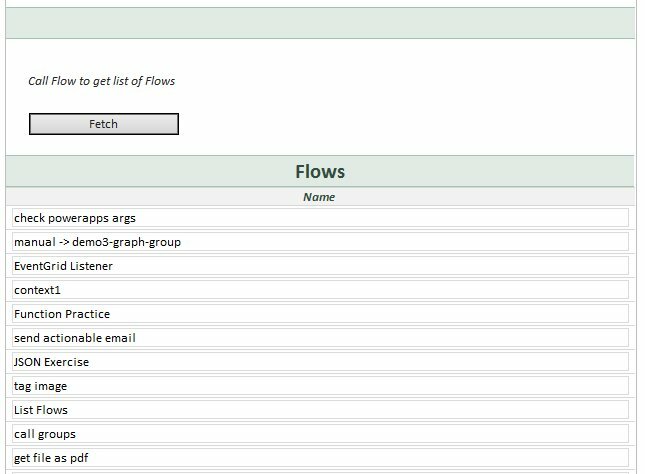 InfoPath is listing in a repeating section the names of all the Flows I have in my environment. Flow gain the ability to work with Managed Metadata today. And so did InfoPath. Only 7 years after MMD was shipped without InfoPath support. In a previous blog post I discussed using Picture Controls to host lots of images within InfoPath and manage the tooltip. InfoPath FormServer renders picture buttons with a pop-up Picture Icon that will hide any alt-text that you've set on that picture. So instead, you should create a separate webpart page, put the Form control on that page, and add this script override for the LinkedPicture_OnMouseOver function. 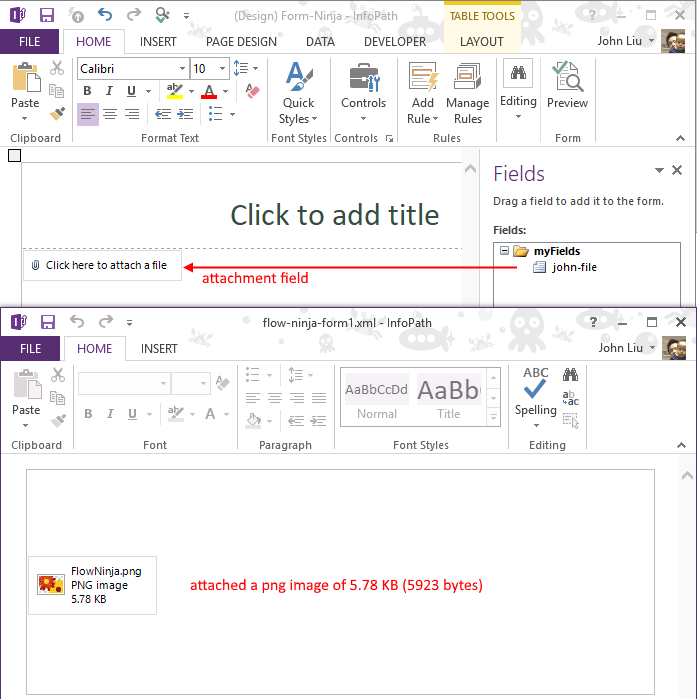 The key is "if (a.disabled) return"
Then in your InfoPath form template, set the control to read-only will ensure the Picture icon doesn't appear on hover, allowing the title text on your image to show up on the browser. The top part of the code is particularly useful if you want to use the Default Values for repeating sections in InfoPath. Your code will read the xml for the default values and insert them into the repeating section. I've previously hardcoded these XML segments for insert, but that's extremely error prone when you inevitably update your XML template with new and more exciting child elements and attributes. "the future is unclear at best, realistically pessimistic and a dead-end at worst"
"I do not use InfoPath any more & I do not recommend people use InfoPath going forward"
"I found that if you used InfoPath in your Organization to empower Information Workers to build their own forms, a lot of the times they’d hit the 80/20 rule and then hand it off to developers who would have to fix them or complete them." I like Patrick's coverage the best, probably because this is his bread and butter. He has been thinking about this and planning for a while. I say: Please Don't panic. I'm sure everyone will have a lot to say in time for the SharePoint Conference. Stay tuned.